Wish you a wonderful weekend! Here the weather is sunny and beautiful for lots of positivity and a good start in the weekend. Me & hubby are both out of loop in terms of sport and now we are discussing which gym to assign to. As for the plans of today, we will go to the Outlet City Metzingen and get ourselves some gym outfit. I have a very late review for you today. Charlotte Tilbury's Eyes to Mesmerise have been reviewed many times but I couldn't make my mind up to pull the trigger for an order. This is a brand I have lukewarm feelings about. I haven't had a complete fail product from her just yet but they also failed to impress me. I shared my feelings of her launching her line by becoming a Youtube Guru for 2-3 months then inserting all the commercial into her channel previously here. I don't think my view changed in any respect. In between though she is running from success to success by opening counters in the States and winning her fan's heart by meeting them in person. This is really a nice way to reach people. Anyway back to the product, Eyes to Mesmerise is a cream eye shadow, which has a similar consistency to Tom Ford's Cream Color for Eyes (e.g. here) and Max Factor's Excess Shimmer (reviewed here). My main goal in ordering and trying it out was to find out to which one it is closer to. Charlotte Tilbury Eyes To Mesmerise come in milky glass pots and contain 7 ml of product, which is more or less the same as Tom Ford's 6 g and Max Factor's 7 g of product offers, that is with the assumption that 7 ml is something around 7 g. It is the first time I see that the volume is given instead of mass. I personally find the entrance of the glass a little too narrow for my long nails but I don"t think everyone has the same problem. The name the product reminds me of Eyes To Kill from Armani but maybe that is just me again. I decided to try out two shades which are not too close to Tom Ford offerings. Some readers might be confused to find out that I went with the green khakish kind of shade, called Veruschka which I am usually not attracted for. From the swatches I have seen online, this shade looked like one of the most complex out of the others and this is certainly true. You can see that it has a nice metallic sheen to it which flashes lots of other colors. Why I like Veruschka is mostly because it is not warm like other Khakis I have, which don't work on me. This one is almost like a grey khaki shade if that makes sense. One thing to mention now is that these pots are not pigmented as much as the ones from Tom Ford so you really need some product to make it show off on the lids. It can be build up without becoming patchy, which is nice. The end result is not as dense and metallic as Tom Ford ones, which might even be of preference if you are rushing in the morning. All in all it is a wearable and nice product, can be blended over the crease nicely. I believe if you have general creasing issues, it might be moving a bit too much though. On my lids, I didn't experience creasing or fading all day. Here is the FOTD with Charlotte Tilbury Eyes To Mesmerise Veruschka on the eyes. I wore this look last week to work on Wednesday and it was very fuzz free. On my lips I am wearing Urban Decay Matte Revolution in Stark Naked (review coming up soon). The second shade I went for was a no brainer really, look at this, this is done for me! 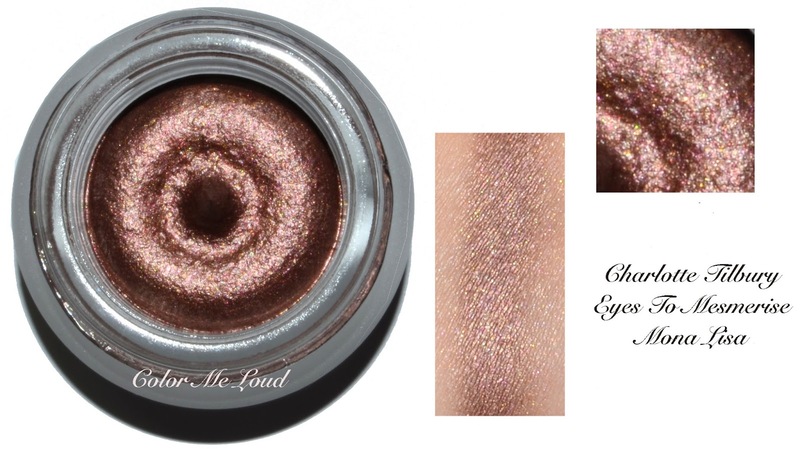 Charlotte Tilbury Eyes To Mesmerise Mona Lisa is a beautiful bronze. The first thing to be mentioned though is that Mona Lisa is not as complex as Veruschka but the pretty color makes up for it. Again the consistency reminds us of Tom Ford but the formula is less pigmented and less metallic. Here is me wearing Mona Lisa on the eyes. You can see that it doesn"t look too metallic and it is not patchy, which are two things which I like about these. It is also easy to blend over the crease and can be build up although it would never look as intense as Tom Ford Cream Color for Eyes would look. I wore them both over Nars Pro-Prime and it lasted all day on me without creasing or fading but your mileage may vary (remember nothing creases on me other than the new Tom Ford Face Color thing, reviewed here). Here is the look from Thursday with Charlotte Tilbury Eyes To Mesmerise Mona Lisa on the eyes. I went ahead and went with purple lips. I am hoping my colleagues are coping up with it just fine. To draw their attention off my lipstick, I wore a colorful blue Hugo Boss shirt with that one. 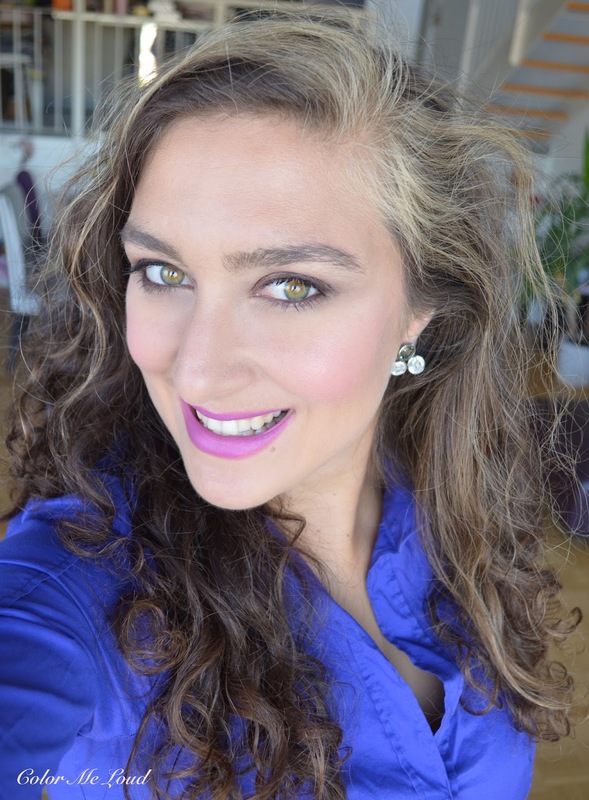 The lipstick I am wearing is Urban Decay Matte Revolution in Bitter Sweet (review is coming up). I am wearing Sisley l'Orchidee Rose Highlighter Blush (reviewed here) on the cheeks, I can't get enough of it at the moment! There are lovely bloggers with their thoughts on Eyes To Mesmerise, check out MostlySunny, BeautyGypsy and Indigo Kir Royale. Please leave below your links if you reviewed any of these cream eye shadows. 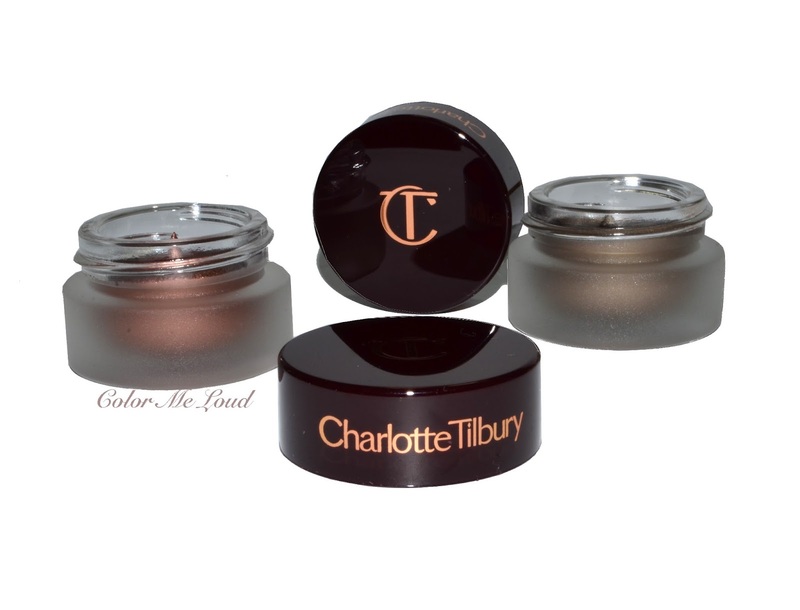 Final thoughts: Charlotte Tilbury Eyes To Mesmerise are attractive because they are more affordable than Tom Ford Cream Eye Shadows and have a similar consistency. That said there is a huge difference between the pigmentation level, which might be a good thing or a bad thing depending on your preference. Talking about how they are compared to Max Factor Excess Shimmer which are one third of the price... It is hard to answer since Max Factor has inconsistency in the line. I find Max Factor in Bronze to be very comparable to Charlotte Tilbury Eyes To Mesmerise. This means it indeed costs much less than it is sold for. That said we know this for any cosmetics product we are buying... Final verdict, like but not love. I prefer Tom Ford's formula. What is your favorite cream eye shadow formula? Hey Sara, thank you so much for the link love and review! As I expressed pretty clearly in my post, this formula is NOT for me. Whatever I did, it creased. I ended up giving it to a friend who has green eyes (because I thought Mona Lisa would look SO good on green eyes). Turned out it creases on her as well. I am staying away from the brand for a bit. I have been disappointed by both the Golden Goddess quad and Mona Lisa. I love Mona Lisa on you! But probably I love your blue top a little more! 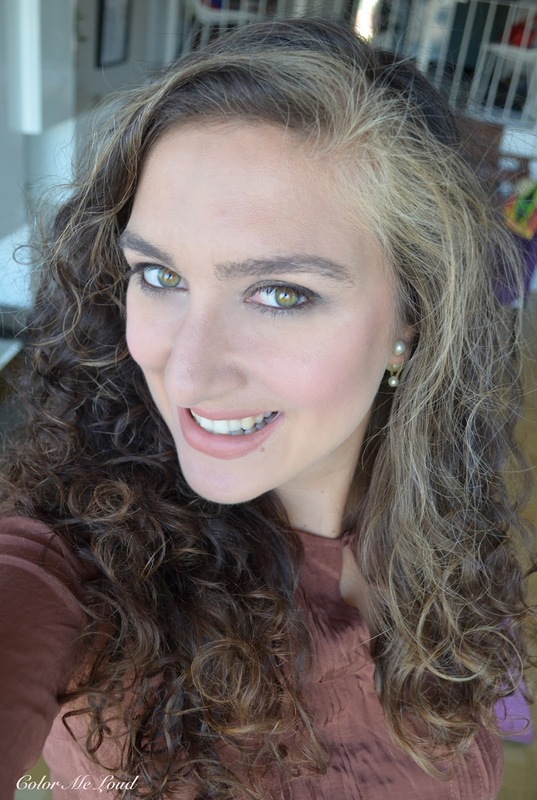 Ah, loving the look of Mona Lisa- it's great on you and so nice paired with a purple lip! I have Marie Antoinette (which is very pretty) and Cleopatra (which I haven't tried yet- I have to find the right occasion) but I really do like the buildable texture. It's no surprise that these are somewhat similar to the TF ones, as I believe Charlotte Tilbury was instrumental in creating the original Tom Ford makeup range! Both look gorgeous on you, especially Veruschka. I really want to try Veruschka, but many shadows crease on me, so I'm worried about that. Hi Sara, I can't wait to get mine! I've been reading mixed reviews, so I'm a little anxious to know how it will fare on me. I hope it'll work because I have my eyes on Mona Lisa and Verushka as well. They look beautiful on you, and those purple lips are WOW! This particular product has been so polarizing when it comes to people's opinions about its performance. Everyone seems to agree that there are some beautiful colors, but when it comes to how the product wears IRL, that's where the great divide occurs. I had the opportunity to blind test two of the shades for a friend of mine who is a highly regarded MA. He was curious as to how well they'd perform on his older clients and so he gave me two unlabeled samples and asked me to play around with them over the course of a week or so. The bottom line was that they applied like a dream and looked lovely for a couple of hours, but that's when the fading and creasing began. The creasing in particular really surprised me because I have moderately deep set eyes with a large moveable lid and zero hooding. All considered, the very early comparisons to Tom Ford's cream eyeshadows have turned out to be totally unfounded. TF is still my favorite for color, texture, finish, and overall performance. Cream shadows are a love for me :). I like Tom Ford for their innovation and colours but it creases on me, unless I have a primer on. And my bank account can't take it most of the time. So, my favourite ones, that have always delivered for me, are the Bobbi Brown ones - the gels and the sticks. Laura Mercier sticks deliver too and I also like Shiseido cream shadows for the lovely colours and staying power too. Sara -lol-I'm sure your colleagues are coping with your rockin' purple lip-if not just point them in the direction of 'Color Me Loud' -! I've been loving cream shadows so much this summer, I've neglected my eyeshadow crayons. Mona Lisa looks stunning on you!!! I've got that one too. But my favourite of this line is Marie Antoinette. I'm still wearing it on alternate days LOL. You know, Tom Ford formular may be my fave but the Charlotte Tilbury colours are so much better. 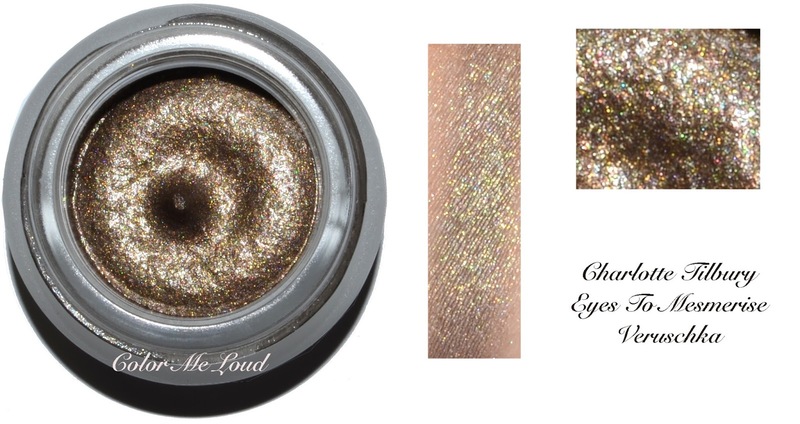 And Chanel Illusion d'ombre ....I love the shades I have, but they do have glitter and fall out. I'll go for CT here. Oh I wish I have your bullet proof lids, Sara!!! Those 2 shades are the ones I would have picked for myself too! But I think i'll just kill them... nothing lasts on me. Varyushka looks so stunning on you! These have had such wildly different reviews. I hate to order one or two to find out I hate them. My husband would argue I have enough makeup and therefore do NOT "need" these. I argue that makeup is a want, not a need. Mona Lisa is such a gorgeous color on you.